The Footballer | Old Morris Tobacconist Victoria BC, Fine Cigars, Humidores and Tobacco Merchantile. 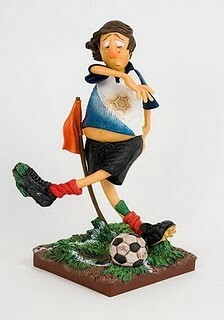 As with so many of Forchino's sculptures, the soccer player is a total buffoon. He's managed to not only whiff on his corner kick, but also get his legs tangled together something fierce.